Edisons delivers the right tools and equipment to help you accomplish the most challenging painting jobs. When the going gets tough and it’s time to get the job done right, don’t settle for inferior products when Edisons provides unparalleled quality with our range of UNIMAC Paint Sprayers. 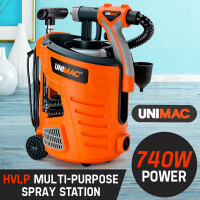 Recognised among the best products on the market, UNIMAC Paint Sprayers are equipped with powerful motors capable of tackling both big or small jobs. Their compact designs are practical and ideal for household storage. They have extra-long high pressure hoses, handy paint pressure regulators and extension wands for hard to reach surfaces. 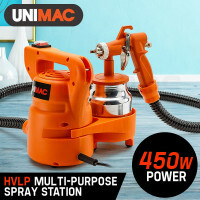 You can’t go wrong with UNIMAC Paint Sprayers. Their tough mesh filtration prevents debris from entering the sprayer, the pressure gauge ensures the precise paint flow is delivered, and integrated comfort grip handles allow for easy transport. Other notable features include extension poles with swivel connection, professional quality guns for consistent results, pneumatic tyres for maximum portability and multiple nozzles for adjusting flow rate. Edisons also offers other quality construction tools and equipment. 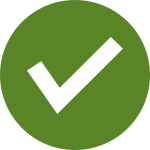 These include hand tools, nail guns, laser level, vacuums, drill bits, and so much more. When buying a paint sprayer, consider purchasing the Bullet Folding Work Platform as well to make your job all the more easier. 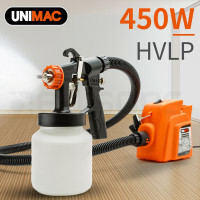 Buy a UNIMAC Paint Sprayer today and start painting like a pro!